Chloe and Ella are complete opposites. While Chloe is the quiet type who works at an insurance company, she’s got a live-in boyfriend named Aidan, who wants them to see the world. Ella’s single (but has a guy she can call for a shag anytime she wants, though never calls her), outgoing, works at and is in the same band as Chloe’s boyfriend, and she dreams of becoming an actress. During Chloe and Ella’s first meeting between these two, it’s clear that they want and envy something that the other has. When Ella and Aidan begin spending more time together, she begins to have feelings for him, though Chloe is furious and jealous, so she allows herself to have fun herself. She goes out with her coworkers and starts to have feelings for a a certain one named Simon, while still hoping Aidan will notice her more, but not everything goes as planned. I’ve wanted to read this book for a long time. Now that I have, I can’t say enough about this book. 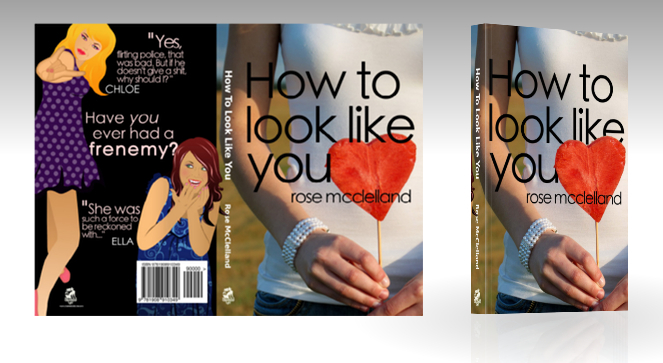 Ella and Chloe were two memorable characters that the talented and creative author, Rose McClelland, created. With each chapter I kept changing my mind about which character I like more. I felt sorry for Chloe because she just wants to be acknowledged in her relationship, wanting it to be like it once was, and is very insecure. I liked Ella because she was confident in herself, though at times I thought she was a little too confident. Also, she seemed to just take to Aidan a little too quickly in the beginning. “How To Look Like You” is a wonderful, light read that keeps you guessing who will get together and who wont-I was even stunned at the end, but it ended just as it should’ve, (thank goodness!). I loved this book too, although I will admit to hoping for a different ending/match-up. Didn’t make me enjoy the book any less though!